SeeWork started on this site in summer of 2013. A few trial trenches have been put in , The topsoil layer was ploughed in the 1950's and early 1960's to a depth of about 150 - 175 mm. This consists of a brown earth layer with a lot of small - medium pieces of limestone, miscellaneous potsherds ranging from a few very small piece of Samian and possibly Central Gauilish black slipware through mediaeval and into Victorian and modern. Also found some quite small pieces of what on initial examination looks like iron age pottery. August 2014 - an intriguing feature consisting of two parallel lines of flat stones a meter apart running N / S laid on top of natural yellow clay. This area between the stones is covered with what appears to be a compacted clay / stone "pavement"
A feature was found below the surface of of this paved area consisting of two worked chert flakes and a very large flat (190 - 200mm by 160mm x 40mm ) polished beach pebble and some unusual land snail shells. One of the chert artefacts was on top of the highest point of the beach pebble. Quite similar to the "ritual" feature found at Culverwell in the floor area. In September a further two trial trenches were dug to try and determine extent of feature - it continues both north and south of the original trench - further work to be done now to determine how far these two lines of stones stretch. Investigation to determine the size and possible meaning of this feature continues. Reap Lane continues to intrigue with, as yet, no termination on either end of the double row of flat stones running North - South. An extension into the trees at southern end of site has uncovered a possible post hole. We are discovering, in the context above the stones pottery, sherds from many different periods including mediaeval, post mediaeval and some 15th/16th C German Raeren stoneware. Of course also we continue to find the usual Mesolithic artefacts found all over Portland. Not evidence yet for habitation as although marine mollusc and limpet shells have been found these are in small quantities. There are other "hot spots" we need to investigate - small circular patterns showing as crop marks at Southern end of site plus may be a trackway. We had a very successful open day in August with lots of visitors. This years dig saw us continuing with trying to understand the site . A discovery was made of a juvenile pigs tooth with a fragment of jawbone in yellow brown clay levels just above natural in T2 and close to the "floor"area, of which more has been exposed with a possible entrance threshold. T4 has yielded another large oval beach pebble with flakes removed - possible chopping tool and close to some Mesolithic scrapers. 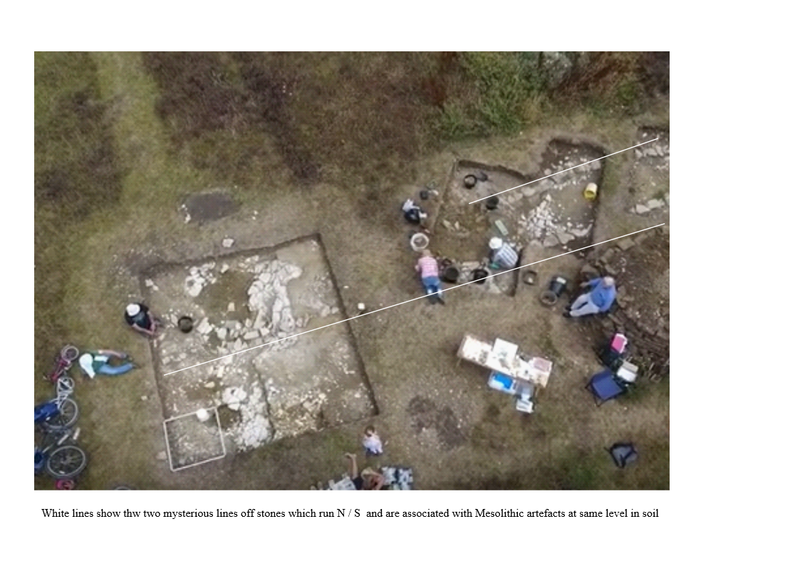 A Trench (T12) placed across a grass circle of lush growth did not show any reason for the circular grass growth but again gave up a lot of small beach pebbles, flint artefacts and some pottery, possibly early mediaeval. Many fragments of mediaeval pottery continue to be found in all trenches and quite a few small beach pebbles. A limited amount of edible shell fish - whole shells of limpets and winkles and scallop shell fragments has been found but enough to suggest a habitation site. The enigma of the two lines of stones continues with them appearing in T9 , although the stones seem a lightly smaller size here. Still digging up in C1 (the ploughed layer above these lines of stones) a lot of early to late Medieaval pottery sherds, mostly well tumbled and generally no bits we can join together - so no whole pots. Some is unglazed, some green / yellow lead glazed.